Have you ever wondered…. What is a Parklet? 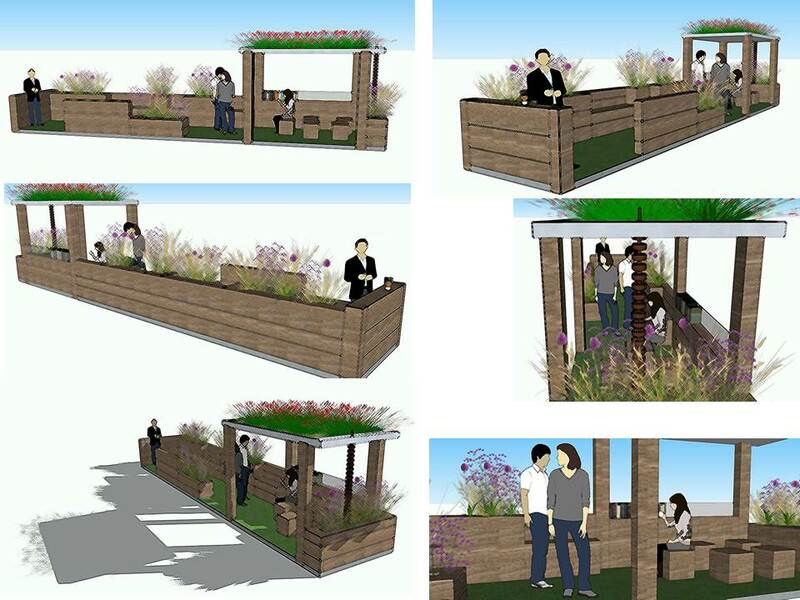 Would love to share with you my recent Parklet design, often spotted in the US but rarely seen in the UK – yet!! A Parklet is a public space, usually an extension of an urban pavement which usually takes up two existing parking spaces and incorporates non-permanent materials. Trees, sustainable planting, bicycle parking, umbrellas and lighting can all be integrated. Parklets often add much needed green space to over populated and densely urban areas such as hectic city centres. Sometimes sponsored by local businesses, local councils or retailers, they make a great public space which can be enjoyed by all – sit read a book, sip a coffee, people watch, munch on your lunch or just take time to smell the roses! Access for all – the scheme is built on an adjustable raised frame of two sections that sits flush with the existing pavement kerb stone edge. Recycled materials – All sleepers are 100% reclaimed and eco-friendly untreated. ‘Pre loved’ artificial grass which is maintenance free and does not require costly irrigation to be sourced from an identified supplier. The sub base for the green roof comprises of recycled crushed brick and recycled felt. The zinc edging which finishes the frames of the base and green roof is from a reclaimed source. All other timber used is from sustainable sources (FSC). Seating – Integrated seating for six, moveable cube seating for five and for those who wish to stand and admire the view another comfortable 5 areas. Biodiversity – Planting associations and a wildflower green roof have been selected for their alluring qualities to bees, birds and butterflies and offer an urban habitat for nature. Sustainable urban drainage – Weep holes are to be incorporated into the lower areas of the sleeper planting compartments. A rain chain has been integrated into the wildflower green roof to allow any excess water to irrigate the rain border below. Library – A small shelf area has been built into the scheme providing a ‘take a book/leave a book facility and offering recycling on a small scale for all those who visit. Low key management – No waste bins have been incorporated in order to encourage visitors to take away and dispose of their own litter responsibly. Delivery – This modular scheme is constructed in sections for ease of transportation and final assembly. Hope to see you on my Parklet one day – we can ‘munch our lunch’ together’!